Hammerworks Traditional Wall Lantern Sturbridge WM102 adds a formal yet classic appearance to any lighting design scheme. These Traditional Outdoor Wall Lanterns make an elegant statement. The combination of the carefully spun finials and the graceful candles enhance any home entryway. In addition, you can pair them with the matching post lights and Colonial Hanging Lights. This assures that you will own a classic combination of traditional wall lights. 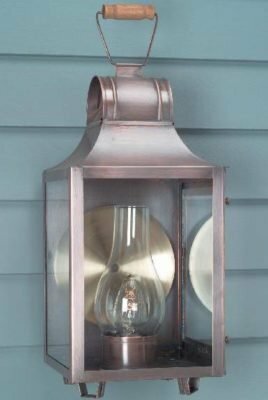 Since each historic style wall lantern is carefully handcrafted out of solid copper or brass, the result is a superior quality light. This ensures that you will consistently receive a durable lighting fixture to last throughout the years to come. In addition to traditional, we also offer primitive style Colonial Wall Lanterns. Thus, whether you own a classic Colonial Home, Antique Saltbox, or Cape Cod cottage, we have the ideal reproduction wall lighting. Each lighting collection is available in a wide variety of sizes and styles to meet your needs. If you are unsure of style & size, our knowledgeable sales associates are happy to assist you in making the right decision. Especially relevant, you can find several coordinating handcrafted Colonial Post Lanterns at Hammerworks. Of course, each classic post mount provides a glowing warmth when lit. Yet the beauty of solid copper or brass lanterns also provides a dramatic accent in daytime. No matter what, when choosing size and quantity of post tops, keep these factors in mind. First of all, in terms of size, larger is usually better. Otherwise, the light may appear too small if not scaled correctly within its setting. Consequently, the distance from the post light to the building, together with the building size itself are decisive factors. 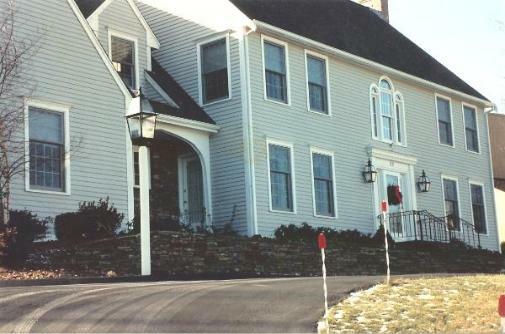 In addition, on long driveways, multiple Cape Cod Copper Post Lanterns may be necessary for proper illumination and appearance.